Students of Teachers College, click here to vote! 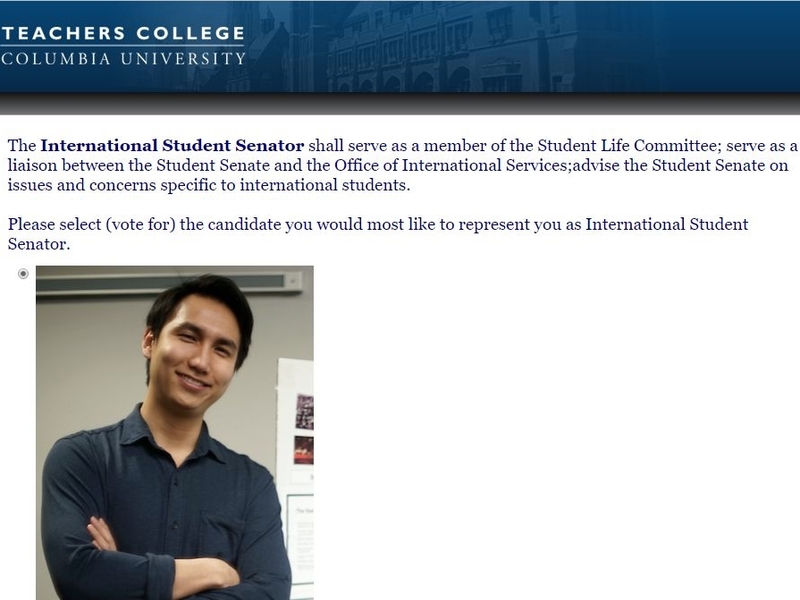 I am competing with 10 other people for International Student Senator of the Student Senate of Teachers College, Columbia University. I've read all the entries & found that everyone is a true contender with something unique to bring to the table. Honestly, I'm no politician & you don't have to vote for me. I just want you to participate in students politics (after all, you're funding this through your school fees) & vote for whoever you think will be a great students representative & be able to inclusively synergise with the greater TC community to enhance the TC experience for everyone, regardless of whether one's international or domestic. If you are so inclined, vote for me here & help tip the odds in my favour by sharing this with your friends on social media. Once I am in office, I will do my best to truly represent & unite the students of TC. "Hi there, I’m Jarod Yong. During my first year as an international, I struggled & faced many challenges as I attempted to be involved actively in academic, social, & volunteer opportunities at both TC & greater NYC. In a foreign land with a foreign culture, foreign food & foreign-looking people, the impostor syndrome monster & the pressure to perform at an Ivy League institution was overwhelming. However, struggle is good because it leads to growth. I want to be part of the Student Senate because there is much room for improvement in the way that international students are included & engaged with at TC. However, we did not come here to be passively coddled. As internationals, we have to jump over ever more hurdles in order to become accepted & empowered members of our new community. As the International Student Senator, I want to be a connector. I want to connect international students with local students, unique experiences in NYC, & awesome food places, as well as give back to the gem right under our noses, Harlem. I don’t want any of us to come to TC & leave as the same person. There is much much more to life & being an educator than mere academic pursuit. Much been sacrificed to get us all here, therefore, I’d like to work with everyone to see how we can make our time here as enriching as possible. I’m an MA TESOL candidate, a Fulbrighter from Malaysia, & was also an international student representative during my undergrad years at Victoria University of Wellington, New Zealand."